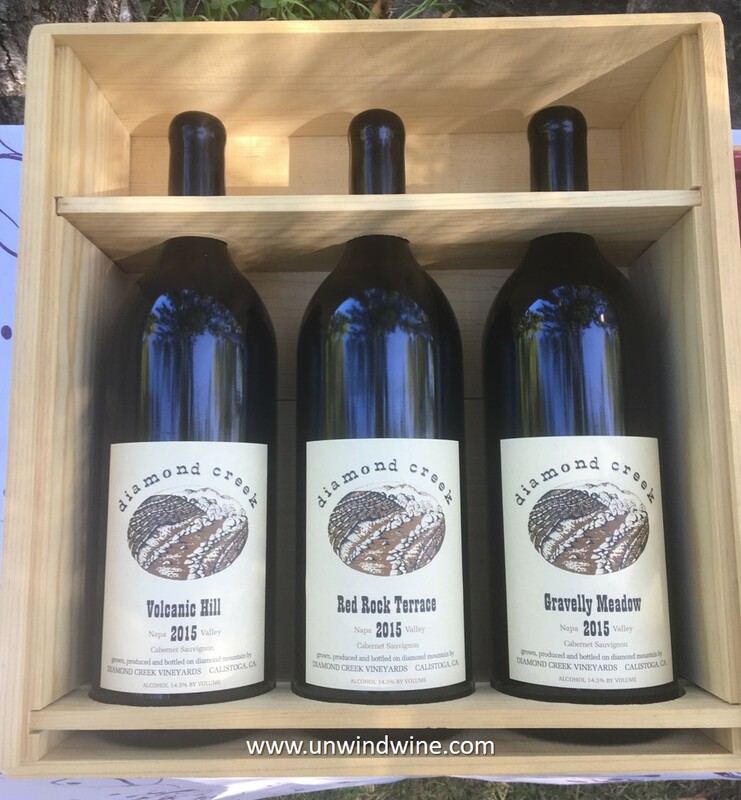 We opened our 2017 Napa Valley Wine Experience with a visit to the iconic Diamond Creek Vineyards for their release tasting of the 2015 vintage Diamond Creek releases at an Open House held at the Estate. 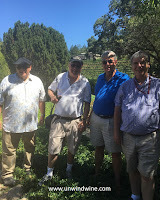 We were treated to a vineyards tour by second generation step-son general manager Phil Ross (left with Pour Boys, Bill, Dan, Rick) and his wife Mary, who shared stories of the legendary founder Al Brownstein and the history of the estate. We know Al was the visionary pioneer who brought Bordeaux varietals to Napa Valley but we learned the original vines were actual cuttings from the legendary Bordeaux first growth Chateau Latour, shared with Al during his visit there in the early seventies. Phil shared stories of the development of the property and Al's passion for designing and building the eleven waterfalls and crafting the lake and parks by sculpting and managing the flow of Diamond Creek that winds through the property. 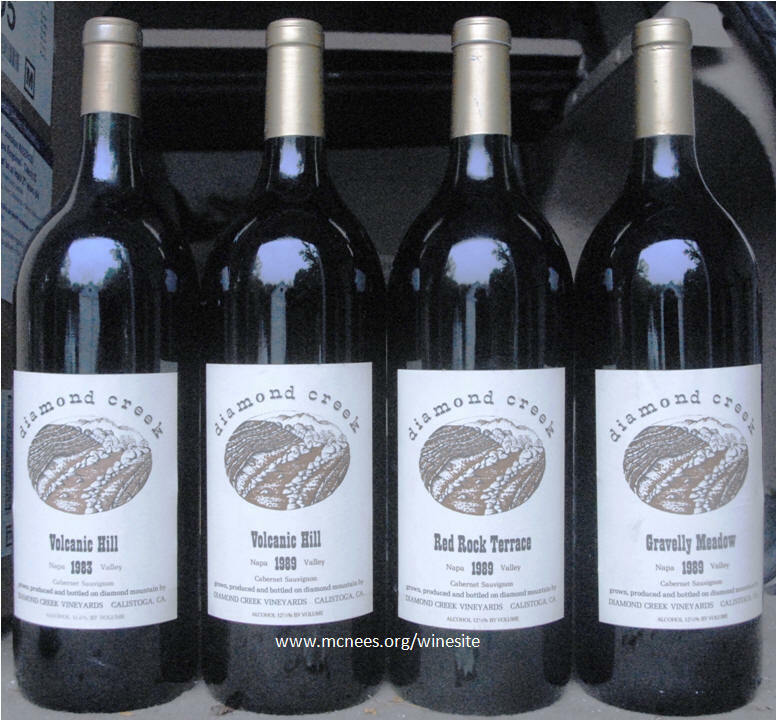 Diamond Creek is synonymous for terroir with their iconic vineyards named for and memorializing the three distinct soil types that comprise the three distinct vineyard sites on the property - Volcanic Hill with its lighter ash soil white slope facing south, Red Rock Terrace with its north-facing slope in red, iron-rich soil, and the pebble stone texture of the five acres at Gravelly Meadow, part of an ancient riverbed, the coolest site of Diamond Creek's three main vineyards. Al was ahead of his time in developing, marketing and branding three different single vineyard designated wines devoted to the three vineyards. Today they are the quintessential example of the distinction afforded micro-climate and terroir based labels, based on their soil types, and angle and slope configuration to the daily sun. 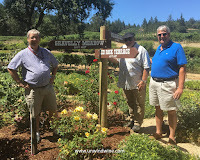 We learned this day that there are 60 different soil types in Napa Valley, half of the soil types found in the entire world, and that Gravelly Meadow is composed of the same soil as found in the Rutherford appellation on the central valley floor, having been washed down from the slopes of the Mayacamas Mountains the form the western slope edge of the valley. 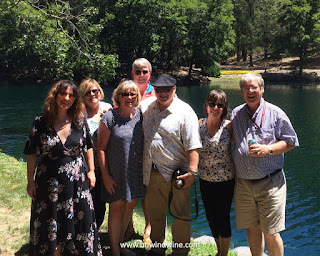 Actually, there are four vineyards and single vineyard designated wine labels if you count the 3/4 acre Lake Vineyard that is only produced and released in special vintages - sixteen times in the forty years of production on the property. Other years it is blended into the other wines. 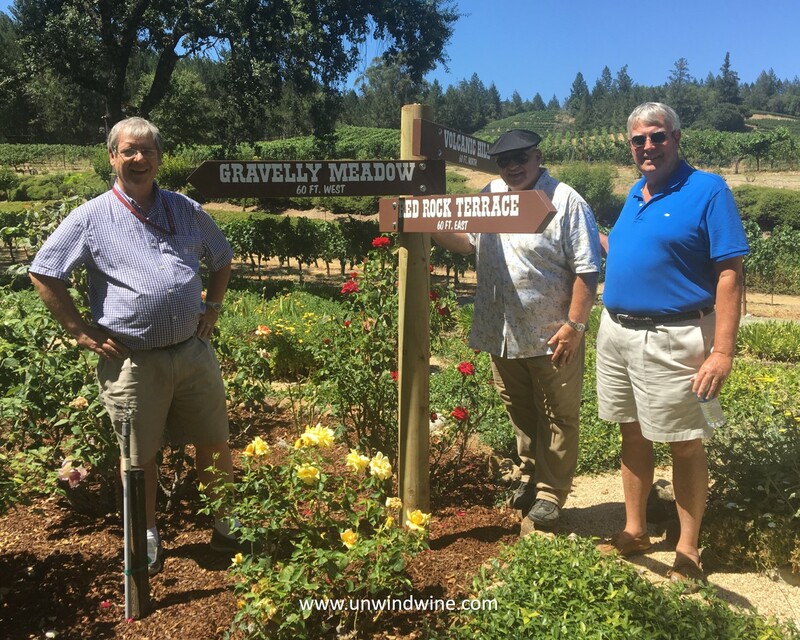 We toured each of the four legendary vineyards and the gardens that Al crafted on the property with Phil sharing stories of their development and evolution over the years. Amazingly, the creek, dam and lake survived eighty inches of rainfall last winter, twice the norm for a season. The day culminated in a tasting of the just bottled soon to be released 2015 vintage of the three vineyard designated wines. 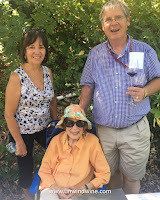 Hosting the event was Boots Brownstein (right), co-founder and matriarch of the family and the vineyards/winery. 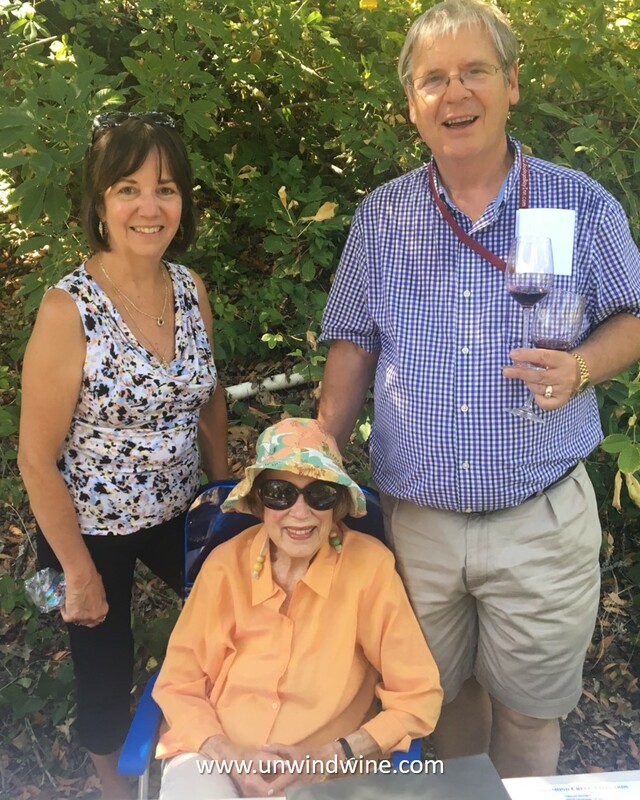 It was a pleasure meeting her again, having met her during our winery visit and private tasting during our Napa Wine Experience back in 2011. We continually debate which is our favorite which I akin to selecting your favorite of your kids ... In my case, probably like others, it changes from vintage to vintage, and over time as the wines evolve and mature, and under the circumstances, as the different profiles will pair differently with foods, cheeses and the like. Always a fun experience when you have the luxury or privilege to do a comparison tasting. At these price points, for most of us, these are special occasion wines. 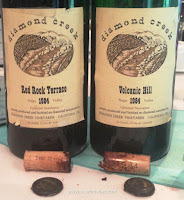 We have many fond memories of previous tastings of Diamond Creek Cabernets. Linda and I served a flight of Diamond Creek magnums at son Ryan's wedding to Michelle Diamond. 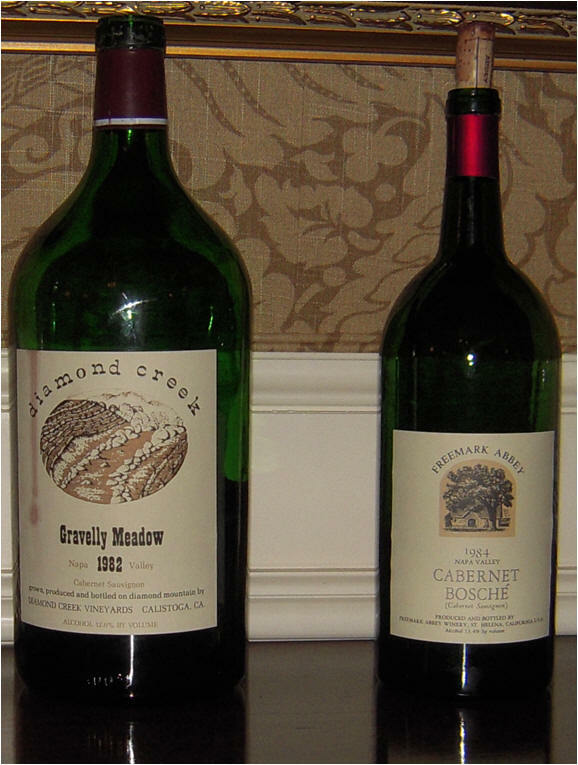 In addition to the horizontal selection of each Diamond Creek Cabernet Sauvignon from magnums we also served several birth year vintages. Birth year wines - Bill and Beth C, served birth-year vintage 1982 Diamond Creek Gravelly Meadow Cabernet Sauvignon from double magnum at the wedding of their son Will. 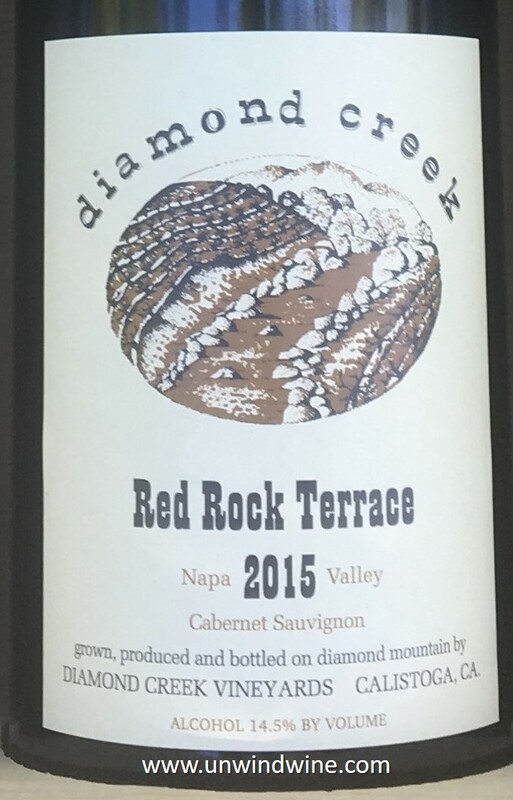 Then, they served Diamond Creek Napa Valley Red Rock Terrace Cabernet Sauvignon 1984 from magnums at son Drew's wedding reception dinner. They featured 1989 vintage Diamond Creek Lake Vineyard for son Matt's wedding rehearsal dinner. 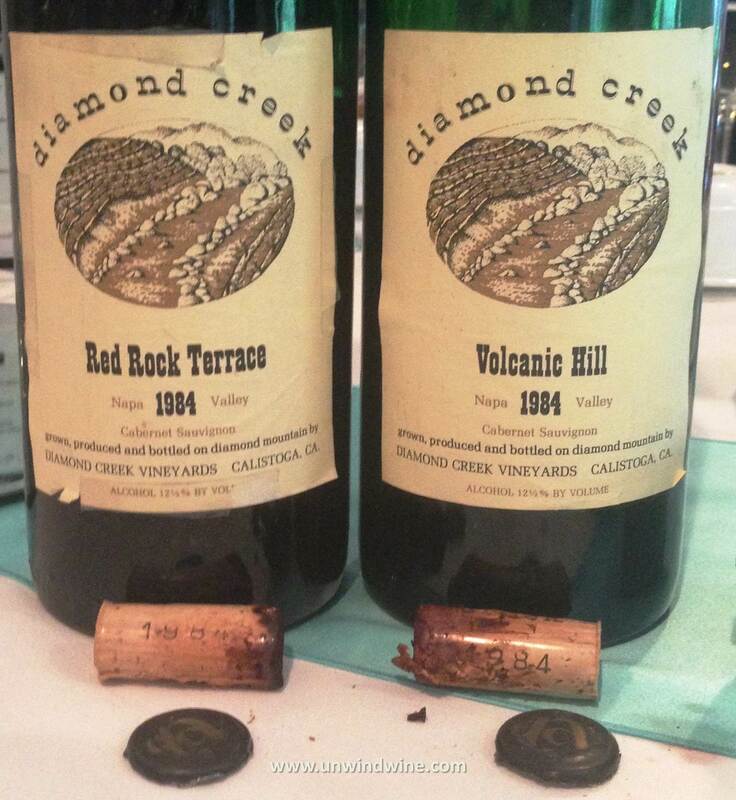 I opened Dan's daughter Hillary's birthyear labels when he announced her wedding engagement at one of our wine dinners. Sis Jan and Bro-in-law Bill, who accompanied us to our Diamond Creek private tasting served Diamond Creek at Gala Wedding Celebration Dinner at niece Krista's wedding celebration. The first of the three labels tasted, it immediately became my favorite, and the benchmark against which the others were compared. This was the most vibrant and expressive fruit of the three, although the others' fruit gave way to more complexity with layer of accent flavors. Dark inky garnet colored, full boded, rich, concentrated black raspberry black berry fruits with notes of sweet clove spice, hints of floral and cassis and black pepper with a long pronounced finish of smooth well balanced tannins. This was more complex than RRT above as it added another layer of complexity with notes of smoke and cedar or camphor. Dark inky garnet colored, full bodied, blackberry and black cherry fruits accented by tones of anise, graphite and camphor and cedar. Like the Gravelly Meadow, this was also more complex than RRT above as it added another layer of complexity with notes of smoke and cedar or camphor. Dark inky garnet colored, full bodied, blackberry and black cherry fruits accented by tones of smokey cedar and camphor turning to notes of anise and graphite on a long complex smooth tannin finish. Phil Ross and Boots Bournstein are in charge of managing Diamond creek today.